The weather gods smiled upon us on Easter Saturday as we rolled up to Autumn and Jenni’s beautiful piece of land in the foothills of the Kaimai’s on the banks of Te Rereatukahia River, just south of Katikati. We welcomed over forty people onto the land, including four or five children and American and Canadian woofers in the opening circle, some who had travelled from as far as Hawkes Bay, Auckland and Raglan to be with us. First up Catherine Dunton-McLeod from Plenty Permaculture led us in a “Christopher Alexander walk”; bringing the architectural idea of “rooms in a house” to “rooms on a property”. We started where the driveway opened up to the whole property, checked into how that felt and then started walking and stopped when people felt a different feeling, an edge of something new, as if entering a new room. This process involves using your instincts to tune into the land and its character. – the first step in the Living Design Process. Shortly afterwards we split into three groups; one to fence around the chicken enclosure, one to construct a low ponga retaining wall and one to learn about sheet mulching. Tom and Matt led the construction of a low ponga wall, needed to edge the parking bay and a band of garden to divide the parking area from the rest of the property. The chicken enclosure fencing appealed to the mountain goats amongst us as the land is very steep in this area. Waratahs supported deer fencing that will have chicken mesh wired to the lower half. The entire enclosure has a mix of summer shade, sunny spots, leaf litter and a variety of foraging areas for the chickens. Catherine led the sheet mulching and explained how you can create a layered bed in situ directly over grass or weeds that is based on layered compost. 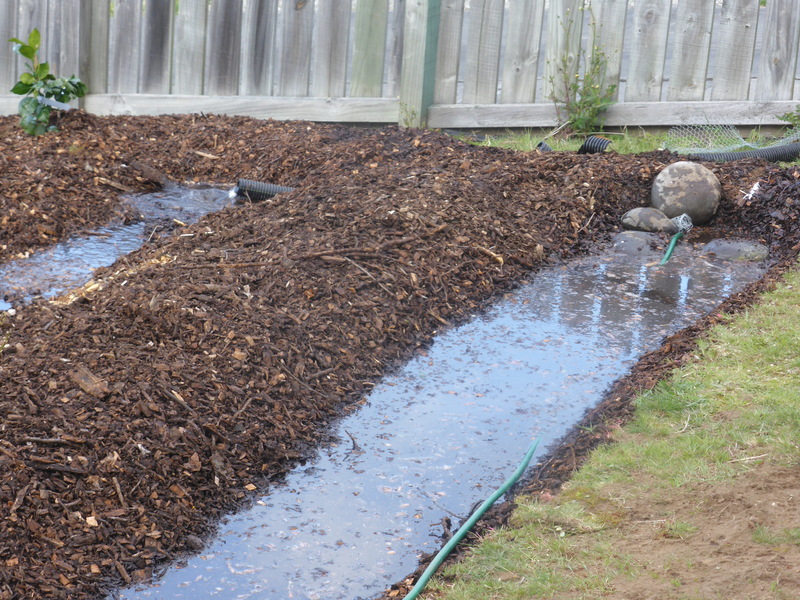 Autumn and Jenni gave the sheet mulching team lots of design freedom to create a transitional winter veggie bed. About 15 new and very experienced gardeners enjoyed wondering together about water flow, sun exposure, should the beds be rectangular, crescent shaped? Should they run with or against the slope? How wide should the beds be to suit the size of our hosts? How would these beds blend with the adjacent “car arrival”, “entrance to the house”, and “piles of waiting materials “areas? Once we had agreed on a design, we were off, alternating layers of carbon (cardboard and bamboo mulch) with nitrogen layers of grass and manure, thin sprinklings of mineral layers – wood ash, egg shells, and seaweed; all topped off with compost and a frosting of bamboo mulch. 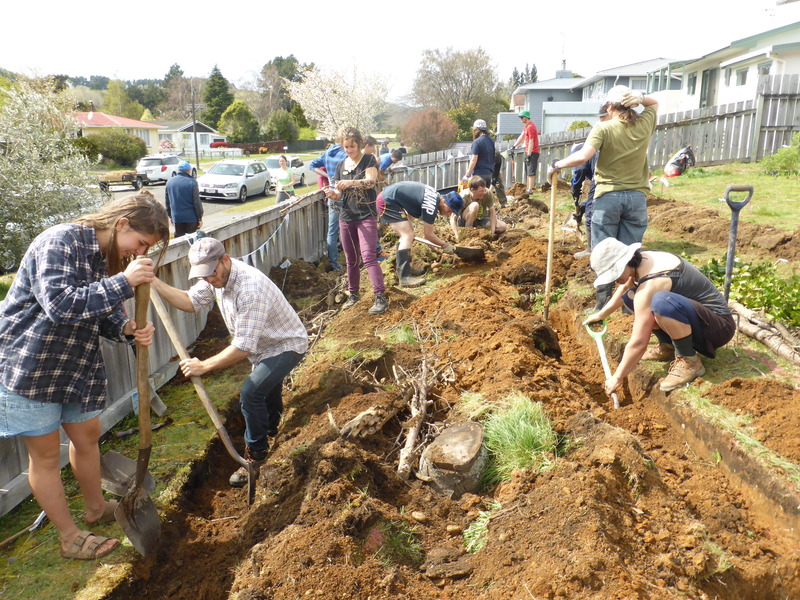 The materials used were supplied by our hosts and participants plus a big trailer of compost was donated by Brett Soutar of Short Bac’N’Sides, Waihi, the fourth time they have supplied compost to a Permablitz. Throughout the day a bank of herb teas was provided by Jenni and Autumn, who own the Herbal Potential “Tea Bar” a caravan that many may know from markets and festivals, serving their own herbal tea and coffee recipes and light snacks. Autumn is also a Naturopath with a clinic in Tauranga, so we were in good hands. The vegetarian lunch that they provided, with help from their woofers, was a feast and much appreciated by us all. The Easter bunny made an appearance and had hidden Easter eggs around the land which the children took great delight in discovering. Following lunch, Trish Waugh led a workshop on Living Design Process, which was used to establish a base plan for Jenni and Autumn’s land development. She explained that initially they walked their land and noted all the zones that felt as though they had their own unique character, much as we experienced in the morning with the “Christopher Alexander walk”. She showed us the Land Characteristic map that was drawn from this with thirteen distinct zones. It enabled Jenni and Autumn to start differentiating the land into separate use areas, two of which were the chicken enclosure and fruit tree areas. They had decided to site their compost bins and garden shed in the zone between these two areas so we used the opportunity of the Permablitz to brainstorm how the compost bins and garden shed could be arranged. This culminated in a great position for the compost where the chickens will be able to access one of the bins where the freshest food waste will be placed. Also, with much discussion and with many hands the garden shed found its prime spot. 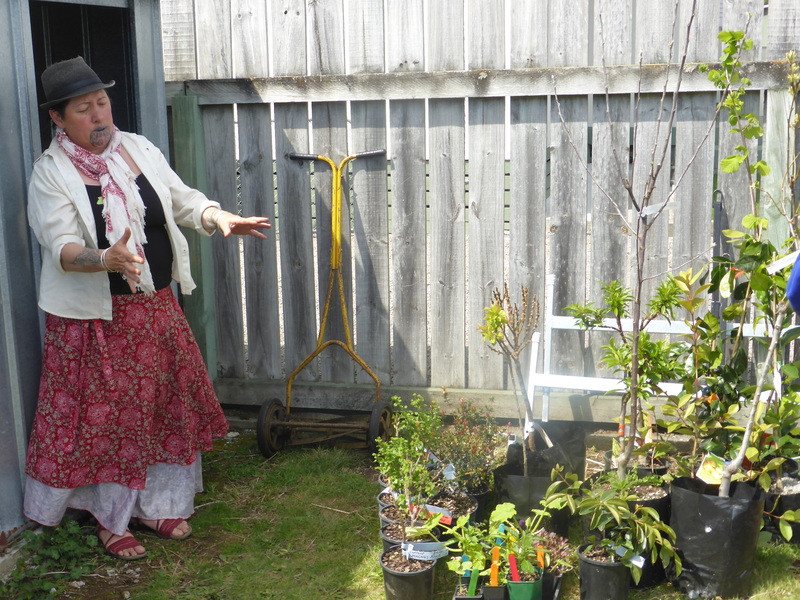 We were then treated to a talk about planning an orchard, siting fruit trees and then a demonstration by Gisella Warmenhoven on how to prune and then plant a young Peach tree. There were lots of questions along the way and it was surprising how many important pieces of knowledge Gisella shared with us. We were also fortunate to have with us Julia Sich “Weed Woman Extraordinaire” who took a group of us on an enlightening walk around the land looking at weeds, their medicinal uses and properties. The ponga wall was finished with a flourish and it was time for our closing circle. So much had been achieved. The expressions on all our faces at the closing circle said it all; everyone was smiling. This summed up the entire day, a great experience all round. Yahoo!! Another successful Permablitz. Let’s do it again soon!! We are starting from scratch on a newly established, beautiful one-acre riverside site just south of Katikati. This is an opportunity to be involved in the very early stages of planning and implementing a Permaculture garden. Trish Waugh will talk about the Living Design Process which has been used here to make some initial decisions about the development of the land. Our hosts are excited about sharing their piece of paradise with like-minded people and invite participants to stay on after the blitz for a shared dinner, swim in the river and to stay the night if you bring your own tent. We have some great workshops lined up and there may be special Easter activities for children (and adults) if anyone is keen. This is a large area, we have room for up to 40 people. Our hosts will provide hot and cold drinks, morning tea and a vegetarian lunch. If you would like to stay for dinner, please bring something to share. -Gardening tools (labelled with your name) – spade or shovel, wire cutters, wheelbarrow. Permablitz BOP is firing up again! On Saturday 9th December 2017 we held the first mini permablitz on Julia Sich’s 870 sm property on Chadwick Road in Greerton, Tauranga. This mini-blitz was a small group of ten people coming together, bringing a shared lunch, for half a day. We got tons done, met some lovely new people and learned about Christopher Alexander’s Pattern Language, double digging, grape pruning and wicking bed construction. The design team of Cath Goodrick, Nicole Buhrs, Julia Sich, headed by Sharon Watt met late November to start the process of planning the blitz and scoping out the section. During the week before the blitz Nicole and Cath had to pull out due to unexpected accidents. Help!! A distress email for additional support drew in Catherine Dunton-McLeod, with her permaculture knowledge and superb organisational skills. The day of the blitz dawned with blue sky and sunshine, thank goodness – organisers are always a bit nervous about the weather the day of a blitz. Sharon welcomed everyone, Julia gave the history and an overview of the property, and Catherine Dunton-McLeod led a permaculture exercise in Pattern Language. A short encapsulation of the homeowner’s desire for the property like this is critical for a good permaculture design and a successful blitz, and is unfortunately a step that often gets skipped. Catherine explained that this sentence would inform everything we did that day on the property. Catherine then took the group out to the road, to the start of the longish driveway, to get a feel of the property from the beginning and to start to view it as a set of “rooms “. (This is straight out of Christopher Alexander’s books: A Pattern Language and A Timeless Way of Building. Read them!!) Just like in a house, a property can have “rooms” with specific functions. Standing at the start of the driveway we identified a “room” we called “entrance off the street.” Julia’s entrance off the street is functional, but does not yet express her statement of purpose – There was little sense of abundance, surprise or aliveness in this room! There was however a big brown concrete wall that we imagined could have a fantastic colourful mural painted on it bringing in those missing elements. As we walked back up the drive, we experienced two more rooms we decided to call – “getting to Julia’s house” and “arriving at Julia’s house.” We had a good time observing and feeling our way through these “rooms” and this showed up areas for future development. Heading to the backyard, work got underway to dig over the four remaining garden beds that had been covered in carpet to kill the kikuyu. The garden beds were marked with lines and the paths and beds prepared. 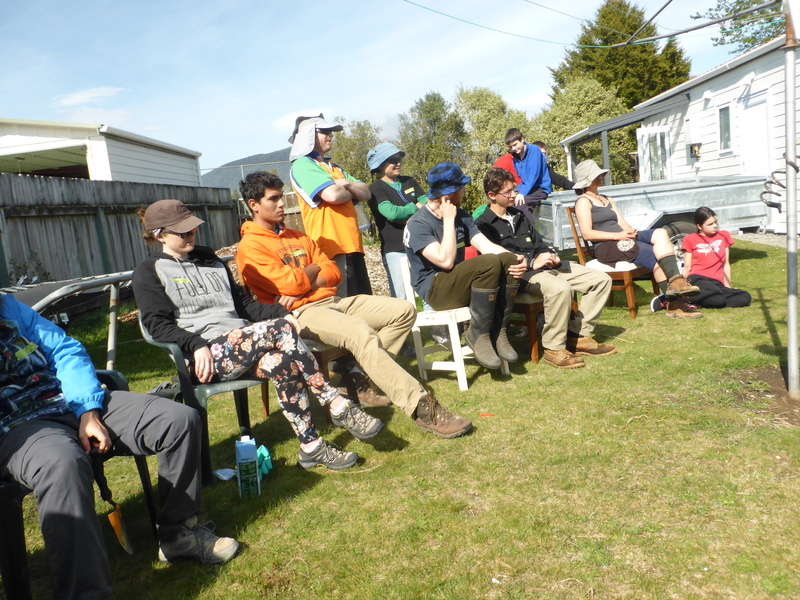 Lora Scully led a workshop on how to double dig a garden bed. Edging was put around almost all the vegetable garden by the end of the day, leaving about a quarter for Julia to finish. Before lunch, Catherine led a workshop on how to set up a wicking bed. Some variation of a wicking bed design is a fantastic solution to keep plants happy in a dry summer, especially if you are away for weeks at a time. Google “wicking beds” to find out more design possibilities. What we did was to use a 200 litre plastic barrel from the recycle container place in Greerton, cut in half. The bottom of the barrel acts as a water reservoir and is filled with a Nova flow drainage pipe inserted in a muslin sleeve (to prevent the sand clogging the holes). This pipe was coiled in the bottom of the barrel and sand poured on top up to the level of the outlet pipe. Another pipe is inserted into the Nova flow pipe to be able to fill the bottom with water. Then a layer of weed mat is placed over the sand and the barrel filled with compost ready to plant. Catherine suggested that several wicking beds could be set up one under another for a cascade effect. The finished wicking barrel with a plant under the outflow. The reservoir in this wicking bed should hold about 30 litres of water and can keep it’s plants moist for weeks. The combined food that people brought along made for a wonderful sustaining, nourishing lunch. Relaxing over the break allowed the chance to chat amongst fellow blitzers and network. Other tasks completed during the morning were grape pruning led by Julia. Val took on the huge job of clearing fern, alstromeria and stones from around a concrete bordered bed near the worm farms. Shade was also erected for the worm farm area. Two wooden posts were concreted in between the house and the hedge to form the basis of a fence and gate that would enclose the garden, act as a wind break, provide privacy, and to make it clear when arriving at the property which door visitors should go to. In the following two days after the blitz ,John, Julia’s brother from Australia, along with Julia built the gate. A huge thank you to all those who participated and to the design team, Sharon who took the photos, Catherine and Lora for leading workshops and the many hands that made light work! Below a view of the garden after the blitz. Woo Hoo! Thank you Permablitz! Let’s have another Blitz soon!!! Compare this with the before shot of the same area. WOW! The time has come for a new region to be born! There a number of blitz events lining up for the coming season in the Turangi/Taupo area and it looks like further growth there is inevitable. Our Central North Island permablitzer’s are proud to be living in the land of the Tuwharetoa people and we look forward to growing our proud community in celebration of new beginnings! If you are currently following permablitzbopnz.net but would also like to recieve blitz announcements and reports, or be involved with permablitz events in the Central North then please log onto permablitzcninz.net and click ‘follow’. We would warmly welcome anyone keen to come along to the third blitz in our region which is scheduled to run late August in Turangi. (announcement will be posted soon!). After a false start the Sunday before, Permablitz #26 took off with a great bunch of people and perfect weather. This was the second time we have blitzed Beccy Dove’s hillside garden. The first time was in 2015 when we re-invigorated an old orchard and planted lots more fruit trees plus we prepared the framework for our earth wall. Luckily this framework of vertical bamboo was still sound and just needed a bit of reinforcing to make a firm foundation for our wall. We were lucky that Rose Tuffery was available for this blitz as she is heading to Costa Rica shortly to further her experience with earth-building. Before we got into it Rose showed us how she prepared test pieces using the local clays available and various proportions of the clay/paper pulp/sand/cement mix. Any earth walling project with good hat (roof) and boots (footing) doesn’t require cement but because Beccy’s wall is fully exposed to the elements we had to use cement. We had also had a trial run several weeks earlier so we were confident the mix would be suitable. A local Waitawheta Quarry clay was chosen and a locally sourced mixed grade sand. We spent some time cladding the bamboo structure of the wall with chicken mesh and wiring this into place to make a solid foundation. Bottles and stacked rocks were used in places to show how various material can be incorporated into the structure. Others prepared the paper pulp and sieved the larger rocks out of the clay. Following morning tea, we got into the fun part (all the kids scrambled to have a go), of foot wedging the pulp into the clay. This activated clay pulp mix was then mixed with the sand and cement with water. It was all hands-on deck applying the clay to the wall with everyone getting a chance to try all of the stages of preparation and application. The afternoon was spent applying the mix to the walls and then adding decorative pieces such as shells, stones, moulded shapes. Christine Burne from Waikino rose to the challenge to create a feature at the start of the walling. We all watched as a taniwha took shape from a pile of rocks. This was a family affair with mother, son, Tony and grand-daughter all helping. A delicious shared morning tea and lunch was enjoyed on Beccy’s terrace. We completed both walls with one bucket of mix to spare. A happy bunch at the end of a successful day with beautiful Karangahake Mountain in the background. Do you have a Permaculture Design Certificate? Do you have an interest in gaining some design experience while collaborating and sharing knowledge with others? Permablitz BOP is looking for more designers to join our team. Design teams are guided by a Mentor, and each team has a Head Designer – who is more experienced with Permablitz, and Support Designers who contribute ideas and learn until they are ready to head their own team. If you are keen to create community through shared experiences, improve the land while providing practical help, and have a PDC, a background in design or a strong interest in becoming a designer, then please let us know. The plan for blitz #16 as well as some of the seedlings that were grown for the food forest!